You should know this – I love the principles of forgiveness. I believe in them. In fact I believe, that the use of our will in the experience of true repentance and true forgiveness, forms the very basis of our relationship with God. Soul-based forgiveness and repentance create the conditions under which the holy spirit may connect to us in a spirit of truth – and in those moments God may Love Us. In addition to that, the forgiveness I have received and given in this life, are among most precious gifts and moments I can recall. Yet here I am at 2am, filling a page with notes on forgiveness. I’m writing to you, but mainly for me, because my heart needs to hear me state the truth of such good and Godly things. To be quite honest, forgiving the pain in my past, well, I’m not finding it altogether easy. Forgiveness requires humility. And not just your off-hand ‘oh, yes, I can acknowledge that that event hurt’, brush away a few sly tears, kind of recognition of pain. Its got to be sincere. Its got to involve a wide open heart, and a willingness to scan the deep recesses of one’s soul. All in a day’s work for people like you and me, right? Well, maybe not quite. Truthfully, I’m a bit knotted up in the tummy over the next phase in this journey, yet I’m determined to do it right this time. My quest to get real on this topic is revealing to me that, despite my tendency get all misty eyed and passionate over the concepts of forgiveness, there are many (many, many) ways that, instead of embracing a process of forgiveness, I have in fact avoided myself and the truth. And I’ve incurred quite a bit of damage to others in the process. I’m not falling into a deep pot-hole of self-hate about it, but here, tonight, I’m calling myself to account. What code do I truly want to live by: One that honours fear, and cursorily acknowledges truth? Or a practice that honours truth, and simply allows my fears to be released in this process? When I honour fear, I live by fear’s dictate. I might pay lip service to God’s Wonderful Truths, but when push comes to shove, fear gets the final say. When I honour Truth, I let fear be present and felt, but I live by God’s Laws. If I truly want to forgive, I’m going to honour through word, feeling and deed, that this process of forgiveness is powerful, healing and truly works. I’m going to face my fear, and hurt, without complaint, restraint and with definite intention to heal. Forgiveness can only be born once we have a deep desire to know and feel our own selves, including our pain. In this, we relinquish any desires for commiseration, retribution or short-cuts. Forgiveness involves allowing and feeling the pain of unloving actions done to you, and releasing it forever. Magically, letting go of pain enables truth to flow to us – the whole truth of what really happened and the Truth that we are lovable and worthy. It can’t happen in reverse, truth always follows humility, which is why our desire to embrace our pain is so essential. The entire process is actually so simple that, as children, we naturally knew how to do it, without thought or teaching. God created us to forgive, She built our capacity for it into the very fabric of our soul. It is through forgiveness that can stay connected to our true selves. It grants us freedom to let go of the past, and to dream anew for our future. But somewhere along the way, we were taught to fear emotion or to fear the punishment we received when expressing it. Or we were continually placed in harmful situations, so we learnt that there was no point to releasing the pain. We shut down as a coping mechanism. Then we went out into a world saturated with demands for ‘rights’, for justice. We see movies that glorify those who seek violent revenge to protect the weak and innocent. Often we are taught that forgiveness is weak and that if we do it we will allow ourselves to be hurt again and again. Does Forgiveness Make us Weak? The truth is that when we truly, authentically forgive, we are far less likely to allow ourselves to be harmed in the same way again. Why? Because in the process of forgiveness we must come face-to-face with the wrong that has been done to us. We grieve this hurt and release it from us. When we face the hurt and the truth of what has been done, we are no longer in denial. Often we enter states of denial in an attempt to create a kind of ‘buffer’ between ourselves and our own pain. This can work for a while, but it also means we are less sensitive to what is actually happening right now. In this state, of using our will to be less sensitive to what is going on around us, we often allow ourselves to be hurt again and again, by numerous people. In engaging the beginnings of forgiveness, we face our pain, meaning that we no longer have the buffer. We are again sensitive to what hurts and more likely to withdraw or stand up to harm directed towards us – not less. True forgiveness never means denying the truth or responsibility of anyone’s actions. So even though we forgive, we may still choose to remove a violent or harmful person from our lives, until a time when we feel that they have repented. In fact, having gone through this process, we are more in touch with our own self-care and respect, since in order to forgive, we have had to face that the harm done to us was not deserved. Before we forgive, we carry our wounds from the past with us. Like a huge set of mismatched luggage, we cart all our baggage with us into every encounter. This baggage is a conglomeration of trapped emotions relating to (sometimes hundreds) of painful events in the past. Emotions are trapped when, as children, we were denied the opportunity to experience the full extend of our fear, pain, shame or powerlessness. But here’s the thing, because its trapped, because we are afraid to feel it, because we live in a state of always trying to look forward to the next destination, trying desperately to ignore the heavy burden of carting all those cumbersome suitcases, we aren’t very sure about what bit of the hurt fits where, and with whom. We might know that we are afraid of being hurt, but we haven’t released the pain of exactly who betrayed us – so we cast that fear out like a huge blanket over everyone in our emotional vicinity. We may feel the deep, and persistent, tug of fear and unworthiness around the edges of our day but we are afraid to discover its exact roots. So we end up seeking relationships and situations based solely on avoiding these feelings – rather ones driven by our true desires and personality. In all of this – we get lost. We loose the ability to discern who truly loves and cares for us from those who might be there to meet an addiction, or even from those who are still hurting us but we just don’t want to see it. 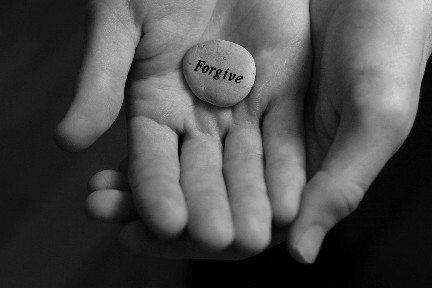 Engaging the process of forgiveness means that we place the hurt where it belongs. For the first time we can clearly see who has hurt us. And we can now discern and seek out those who have our best interests at heart. Engaging forgiveness softens us to our pain, but it also makes us strong to our own desires and empowers us in reliable self-care practices. [*] which may or may not be correct – the point is that we must feel what we carry as hurtful feelings towards us, clarity will come as we go. This entry was posted in Forgiveness, Growing Great Soul Qualities, Humility on February 8, 2013 by Mary. Hey David, thanks for your comment. I’m planning a post on ‘forgiving self’ but I feel its a big issue for most of us. It certainly is for me. Mary, what does “the use of our will” mean. Is it just our desire? Is it about trying to create our desire to feel our pain? What role does our intellect play in “our will”? What if in being honest with ourselves we realize that we really don’t want to feel our pain? How can I honestly pray to God to help me feel my pain when I honestly don’t want to feel my pain? Hey Graham, Thanks for this great question. I feel that our intellect can be a handy tool in coming to terms with the truth of our desires. e.g. we can use our intellect to measure the difference between what we say we want and what we actually do. When we find a huge discrepancy we can reflect that maybe what we say we want, isn’t what our heart desires (since our actions are always a more accurate measure of these things). So if we find ourselves in a place where we have to face that we don’t actually have the desire to forgive, I believe we are making progress! Loads of us kid ourselves that we do want to forgive, but our lives reflect a different truth. Once we realise this then I feel that there are a number of steps we can take. One of these is to ask ourselves, without any self inflicted pressure of ‘what we should be doing’, why we don’t want to forgive. This usually reveals the false beliefs or fears that block our natural forgiveness in hurtful situations. These are the things that we must work on in order to grow desire. We can’t think our way over, under or around them. We have to acknowledge these blocks as valid feelings that we can choose to feel, rather than continue to act upon. I hope that’s clear Graham. I think you have just inspired another post from me on this topic! wow, what a post. ❤ This is written so eloquently, and logically, it helps a lot to serve as both a reminder and to help those here (and the spirit world) understand more what true forgiveness represents. I am grateful for your posts Mary. I struggle with pure heart felt desire to practice Forgiveness still. What I am seeing though is that if I don’t forgive my life is not going to change radically and those who love me most and whom I really really like and love, they are the ones who actually ‘suffer’ or receive the brunt of my lack of forgiveness as they get ‘blamed’ for the error and pain I hold onto. This in itself causes more pain and a cycle that creates more and more damage. It is amazing how often I am shown myself in others and how it seems so straightforward about what I need to do to change and how ‘easily’ it could happen and yet I resist so hard. I am not always understanding this experience except that maybe it is that I get it ‘intellectually’ and can ‘see’ what is happening and what I need to do but I am not actually getting it emotionally and feeling it. Anyway Thanks again for writing on this subject. I feel it is vastly relevant!! “When we face the hurt and the truth of what has been done, we are no longer in denial. Often we enter states of denial in an attempt to create a kind of ‘buffer’ between ourselves and our own pain. This can work for a while, but it also means we are less sensitive to what is actually happening right now. In this state, of using our will to be less sensitive to what is going on around us, we often allow ourselves to be hurt again and again, by numerous people. I feel one of the great challenges in starting to feel again (even before considering forgiveness) is the tremendous pain involved in the process. I started off wanting to have a happier life and did indeed feel some joy but my over-riding experience is feeling pain and jealousy and anger and hurt – and really not feeling comfortable with these parts of myself that seem so immature and needy. My facade is as a mature, grown up and it covers a seething mass of contradictions and immaturity. Even worse has been that when events come that trigger these emotions, the emotions in me seem completely out of proportion to the event happening now, until emotionally they are traced back to their source then it all seems to make sense. Not understanding something is very frightening to me and that period of feeling “out of my mind” has been a challenge. When I heard the quote on true religion ” We recognize but one religion here, that is – Love; and all its disciples have but one denomination – lovers of mankind.”….I realised then, as Graham says, that I didn’t want to love mankind. I did not want to forgive especially anyone who had hurt me or could hurt me and basically that’s everyone except little children. I want to stay angry and nurse my resentments because I do not want to give “them” the satisfaction that they have won and got the better of me. The problem is the ones who are “guilty” are not suffering my backlash – the husband I want to control so he doesn’t hurt me is in the prison rather than the men who put the hurt there. We have a saying here in the Uk that goes something like “this will sort out the men from the boys.” I feel this is appropriate here – if I really want to be purified I’ll look at my attitudes and beliefs and correct them….if I really want God in my life, I’ll ask him to help me or look at why I don’t feel he can or would want to help me. I suppose that is a question….is it possible for the atheist or for someone on a natural love path to fully forgive. I’ve had a bit of interest in what these people are teaching and I suppose these would be natural love techniques. I suppose that probably demonstrated the frustration I felt about religion in that they did not practice what they taught and non-religious people seemed to making a more sincere attempt to behave better. The article you reference on restorative justice is absolutely fantastic. So much to look at and contemplate on.I often wonder about the Law of Compensation and whether it will be like being faced with how a little comment to a sibling say that they looked fat (delivered with some venom) will be played back to us with the whole effect that this had on their life…in every little detail.